The stories are based on two funny, and brave hearted, animated Bernese Mountain Dogs, (large pups) and their group of friends called the K-9 Team (Park Gang), who spend their time traveling the world as rescue dogs diverting disasters. The backdrop for the characters is an incredible and mysterious old fort in Maine where the characters and their family, the Reynolds, live and plan their adventures. 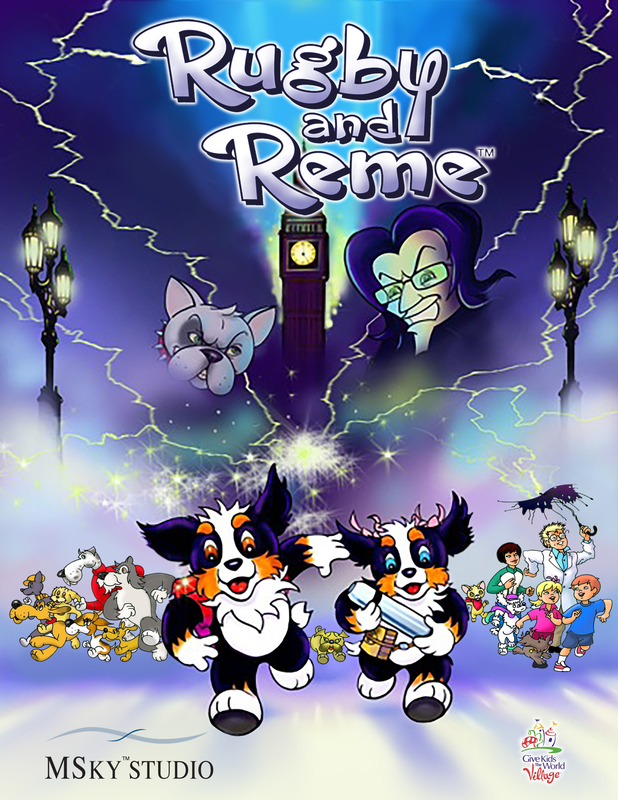 All Rugby and Reme’s™ adventures are pumped up with action and silly humor that generates excitement and a feel good reaction from its target age group, children 4-8. The lessons our characters learn and share throughout their adventures are subtly layered in the stories and delivered frequently with humor. Rugby and Reme™ have a real retro feel, emphasizing the fact that “kids and dogs are timeless together”. We are looking for licensing representation, plus animation opportunities (shorts, TV, feature film-live and animation). We currently have produced Rugby and Reme™ Kids Adventure Products that include: small and large plushes, playing cards, small dog houses, backpacks, tote bags, hats, tee shirts, and bandanas. We also have a fully developed and tested K-3rd learning program with beautifully illustrated books, curriculum, and DVD’s. In addition, Movie Packets for the Rugby and Reme™ Animated TV Series, Animated Full Feature Movie and a Live Action Movie are available upon request. The Rugby and Reme™ Adventure Series is designed as both a read along picture book or to be watched on DVD’s. With beautiful illustrations for younger children, and an early reading series for ages 4 through 8, the series provides teachers and parents with a highly tested curriculum, designed around the fundamentals of cognitive learning. 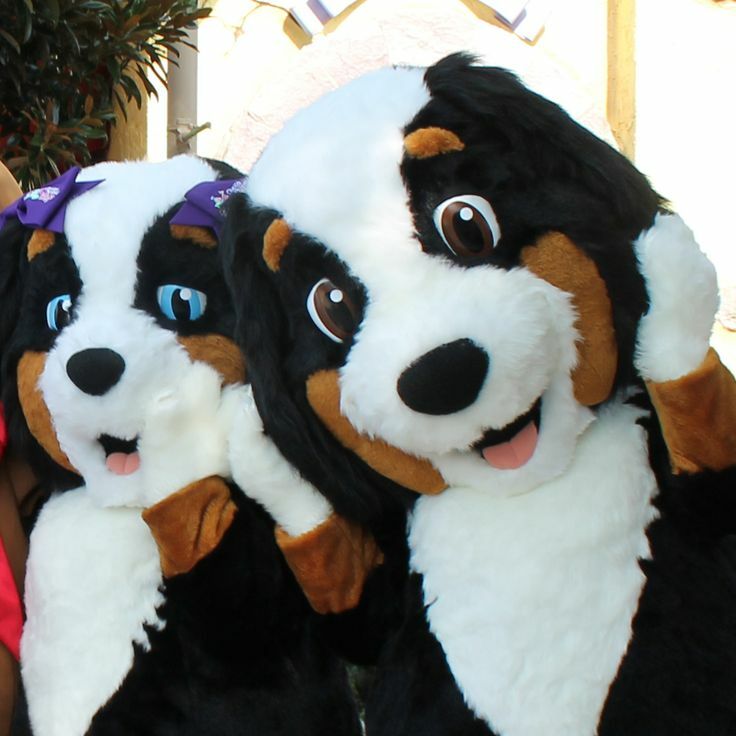 Give Kids The World (GKTW) is proud to introduce the newest and furriest members of our character family – Charlotte-based MSky Production’s Rugby and Reme. This Bernese Mountain Dog duo are the stars of “The Rugby and Reme Adventure Series” for children and recently made their debut at the 70-acre, nonprofit resort in Central Florida that provides weeklong, cost-free vacations to children with life-threatening illnesses and their families.The co-visionary behind the playful pups, Doug Crouch, vividly remembers that wonderful snowy day he brought home the actual brother and sister puppies from Vermont that inspired the series. Friends constantly commented that the funny stories and adventures about their antics would make great children’s stories. So, Doug took that to heart and spent the last seven years passionately creating both a family entertainment and publishing company around a myriad of funny animated characters.